I'd like to announce that it is OFFICIALLY autumn. The air is cold, the leaves are crunchy underfoot. The days are getting rapidly shorter. If you're anything like me, all you want to do is curl up in your favorite chair with your favorite blanket, your favorite brand of tea in your favorite mug nearby. It's time to be cozy, to stay indoors. It's time for a deluge of autumn books. I, personally, can not wait. "But Meghan B," you ask, "what books are coming out this fall that we should read?" Well, nameless and faceless person, you have come to the right place! I've got all the best books coming out in the coming weeks in one handy dandy post for you! Because I love you and because I care. Do you like romance, suspense, magic and all things generally awesome? Then this fall is going to be an amazing time for you. Join me after the jump for all the best books you're going to want to get your grubby little hands on this autumn! Vicious by V.E. 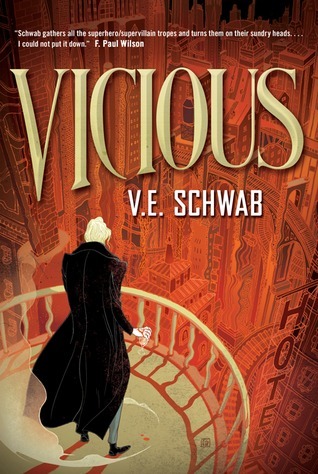 Schwab (already released): I'm one of those people who are always obsessed with villainy. I'm more likely to cheer for the Joker rather than Batman. Vicious gives me my dose of villain hijinks in amazing, beautiful ways. It's the story of two friends who gain super powers and how they deal with them. One chooses to be a hero and the other... well, who doesn't love a good villain? This is going to be one of the most talked about books of the season. It's a superhero story, a story of redemption and friendship and what happens when absolute power corrupts absolutely. Do not miss this book! Republic of Thieves by Scott Lynch (already released): It's been six years since we last saw Locke Lamora and Jean Tanner, the last of Lynch's Gentlemen Bastards. The only book in recently memory that's been this long awaited has been those epic Song of Ice and Fire tomes that GRRM publishes when the planets align and the right number of virgins have been sacrificed. Republic of Thieves is two stories in one. Part of the novel is Locke and his fellow Gentlemen Bastards pulling off their first big heist, exploring the beginnings of Locke's relationship with the secretive and beautiful Sabetha. The other part of the novel pits Locke and Sabetha against each other in a game of political intrigue. It's exquisitely written and woven together beautifully. It was worth the wait. Dead Set by Richard Kadrey (Oct 29th): In this stand alone novel, Sandman Slim scribe Kadrey brings us a tale of dreams and terror. A young woman has lost her father and moves to the city with her mother to start over. She starts to see weird things in her dreams and a chance encounter in a record store changes her life. She can speak to her dead father but for a price. It starts small (a lock of hair) but soon she's asked for things beyond her to give. 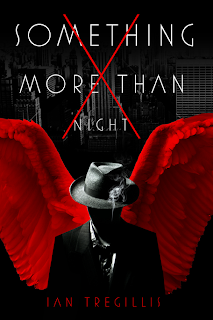 If you're a fan of his bombastic Sandman Slim novels, then this novel is one you can't afford to skip out. 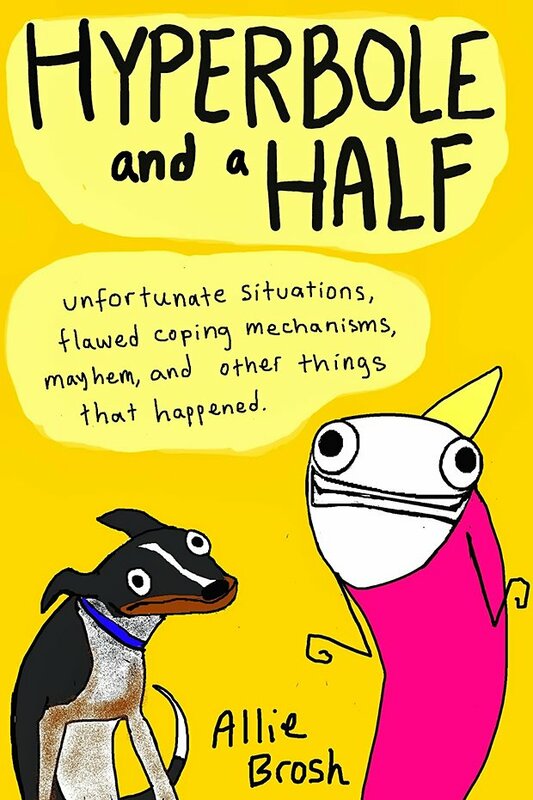 Hyperbole and a Half by Allie Brosh (Oct 29th): The hilariously brilliant Allie Brosh brings us a collection of her internet scrawlings and doodles. One of the funniest people on the internet, Brosh has delighted her readers for years with stories of her very simple dog, how hard being an adult is and, recently, a heartbreaking and just plain amazing explanation of what it feels like to suffer from depression. READ ALL THE THINGS! Curtsies & Conspiracies by Gail Carriger (Nov 5th): This is the second outing for Carriger's new heroine. We catch up with her and her friends as they continue to learn things all good ladies of breeding must know; deportment, dancing, manners, proper tea pouring... oh, and how to be assassins and spies. This delightfully demented romp maintains all the weird and wonderful things that made us love Carriger. Keep an eye out for some memorable and immortal characters from her outstanding Parasol Protectorate series to pop up! Gossamer Wing by Delphine Dryden (Nov 5th): A new steampunk series! Oh, be still my heart! I love nothing better than a fun steampunk novel! This one sounds both hilarious and fun. This sounds as if it will be another series where each book is headlined by family members. This first novel involves Charlotte Moncrieff, recent widow and spy. She is tasked to steal important documents but needs a good cover. Enter Dexter Hardison, a scientist and fellow spy. This novel sounds packed with adventure, high risk theft and romance. I can't wait! Soulless Manga v3 by Gail Carriger (Nov 19): This is the manga version of the third book in Gail Carriger's fantastic Parasol Protectorate series. The art is beautiful! I'll take any reason to revisit Alexia again! Fortune's Pawn by Rachel Bach (Nov 5th): Rachel Bach is a pen name for Rachel Aaron, who wrote one of my favorite fantasy series of all time, The Eli Monpress series. She's shifted her focus from fantasy to sci fi to bring us the beginning of a brand new series. I'm so excited I can barely contain myself. Devi Morris is an ambitious mercenary who signs up to work on a troubled ship and finds she may have bitten off more than she can chew. It sounds like the start of a mindblowing space opera series. Darkwalker by E.L. Tettensor (Dec 3rd): A steampunk-tinged urban fantasy and detective novel all in one. Nicolas Lenoir used to be the best detective around, before he tangled with a vengeful spirit who still wants him dead. Lenoir must out run this demon before his time runs out. 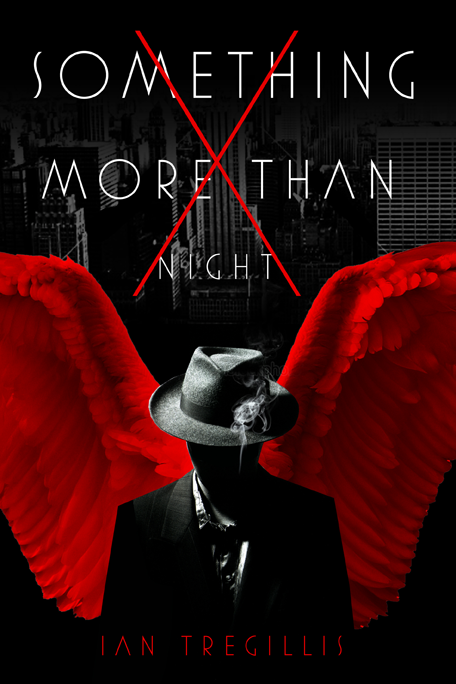 Something More Than Night by Ian Tregillis (Dec 3rd): A noir mystery novel with a twist. The setting is Heaven and someone has murdered the archangel Gabriel in cold blood. It's up to Bayliss, a rank and file angel with delusions of Philip Marlowe grandeur, to stop chaos from tearing Heaven and Earth apart. I am in love with this idea. It's like the author threw The Maltese Falcon (the stuff that dreams are made of!) and Paradise Lost into a blender and hit "puree". Deaths of Tao by Wesley Chu (Oct 29th): This follow up to The Lives of Tao brings us back into the crossfire between warring alien factions that use humans as their hosts. I am so deeply excited for this book! The Lives of Tao took me completely by surprise and I'm anxious to learn more about Tao and Roen. Who doesn't love aliens who are playing a giant game of chicken with humanity? Dying Is My Business by Nicholas Kaufmann (available now): I just recently learned about this novel and now I can't wait for it to arrive on my doorstep. Trent has a special kind of immortality. When he dies, he wakes up a few minutes later completely healed but with no recollection of his past. It's like supernatural Momento. Because of his special quirk, Trent signs up to work for a Brooklyn mob boss and realizes, perhaps a bit to late, that he's in over his head. 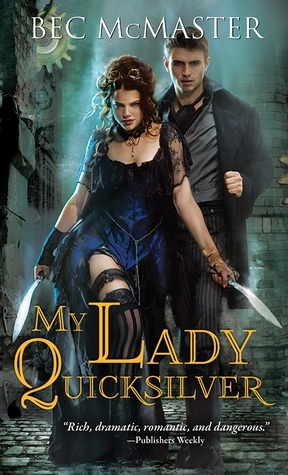 My Lady Quicksilver by Bec McMaster (available now): Kathy and I are huge fans of this steampunk series, and the third novel is sure to please. The seedy underbelly of Steampunk London, vampires and werewolves... you can't go wrong. I've been waiting for this one for months! What books are you looking forward to this fall? I want all of these. Engines of the Broken World is another one I want to read. And Katya's World, The Faceless one, Two Serpents Rise.... Still working on that machine that gives us more reading hours.